Zenith just arrived from the Birmingham Track Adoption Kennel. She raced 74 races at 58lbs. She got up to A level at that track and also raced at Palm Beach in Florida. In her last race in July she pulled up and didn't finish the race due to a minor injury. She recovered and was adopted to a family in Birmingham. They couldn't keep her so returned her a few months later to the track adoption center and we picked her up not long after she arrived. She just turned 3 on October 12th. Her sire is Soprano Drive and her dam is Kiowa Surfingirl. She has the same mom as CRT Lenny, one of our other available dogs! 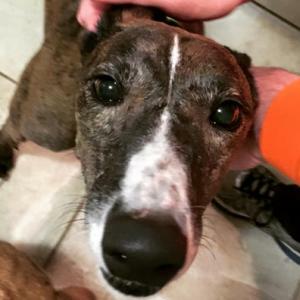 Zenith has an unusual dark chocolate brown color between her black brindle stripes. She also has a cute white blaze on her nose and white on her chest and toes. A really cute girl with a very sweet personality. She loves to get the other dogs in her foster home to chase her and is very friendly with people. Her foster home describes her as the happiest greyhound they have ever met.